Everyone says that Max is drowned, but Charlie thinks differently: she was in the mill-pool with him, and knows exactly what she saw. When she begins to see him in her dreams, her hopes are raised. It seems the reunion she craves is possible. But where exactly is Max leading her? And will she be able to return? 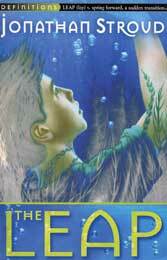 This novel began with a short story, The Millpool, written in 1992. That in turn was inspired by the mill streams I used to see as a child, deep and cold and fringed with mossy stone; lovely and tempting on a hot day, but dangerous too. The Millpool was about two children picking fruit beside such a place, and what happened when one fell in. 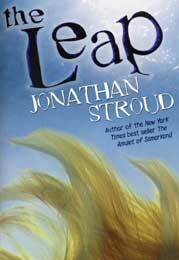 Much later I adapted it into the first chapter of The Leap. After the high adventures of Buried Fire, I was interested in a more low-key and subtle investigation of how fantasy and reality collide. The book is split between the perspectives of Charlie, who believes something strange has happened, and her brother James, who doesn’t. It is up to the reader to decide whose side to take. One of my inspirations for this was Henry James’s The Turn of the Screw, a brilliant ghost story that can be read in different ways. Much later, I used the idea of opposed perspectives in the Bartimaeus Trilogy, where we alternately follow Bartimaeus’s and Nathaniel’s sides of things. "Atmospheric and intriguing… the quality of writing never flags"
"A finely choreographed novel of displacement, death and friendship"